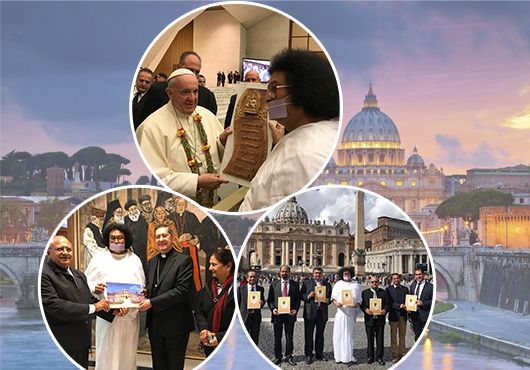 JAINA Newsletter: Acharya Lokesh Muni Met Pope Francis, Jain Photo Exhibit At Rice, Jain Story etc..
HH Acharya Lokesh Muni, along with a high level delegation, invited HH Pope Francis to visit India. More details of their meeting is given below. Jain photo exhibit goals to build awareness and capacity for Jain studies at Rice. More details are given below. JAINA invites Jain Centers to send news article with photos about their Center's “Chha Gau Siddhachal Yatra” celebration. Please send your article (maximum 10 lines in word file) and 2-3 photographs of the event at jainahq@jaina.org. The nights that have departed will never return. They are profitable for one who is given to dharma (righteousness). Q 1: How many Paryaptis do the two-sensed Jivas have? Q 2: How many Prans do the two-sensed Jivas have? World-renowned Jainacharya Dr. Lokesh Muni had a historic interfaith dialogue with Supreme Religious Leader His Holiness Pope Francis at Vatican City on March 7, 2018. Acharya Lokesh accompanied with high-level delegation invited honorable Pope for the International Interfaith Conference organized in New Delhi. In the historic meeting, international issues like World Peace, Religious Harmony, Environment Protection, and Human welfare were discussed. Pope was delightfully receiving the invitation from Acharya Lokesh to come to India said that International Interfaith Conference will be a step ahead towards World Peace. His Holiness Pope Francis addressing the delegation said that "I hope and wish to come to India soon and inter-religious dialogue is necessary for the protection of humanity, World peace, and harmony". Jainacharya Lokesh Muni was accompanied by a high-level delegation comprising of Senior Vice President of JAINA Mr. Mahesh Wadher from California, Mr. Anil Monga from New Jersey, Mr. Karamjeet Singh Dhaliwal, Dr. Raj Bhayani, Mr. Kamlesh Mehta from New York, Mr. Subrata Ganguly from Kolkata and Mr. Bhavya Shrivastava from New Delhi. Senior Vice President of JAINA Mr. Mahesh Wadher presenting a JAINA 2018 Calendar to His Excellency Bishop Miguel Ayuso and HH Lokesh Muniji. A new exhibit introducing the Rice University (Houston) community to Jainism is now on display at Fondren Library. 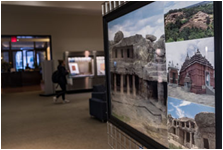 “Structures of Striving,” consisting of colorful 24-by-36-inch photos of Jain temples and structures, will be viewable through March 23 in the main first-floor hallway of the library. The exhibit is the result of collaboration between Brianne Donaldson, the university’s first Bhagwan Mahavir and Chao Family Foundation Postdoctoral Fellow in Jain Studies. The goal of the exhibit is part of a larger aim to build awareness and capacity for Jain studies at Rice University, said Donaldson, who had overseen Jain exhibits in the past when she was director of the Center for Jain Studies at Claremont School of Theology. They aim to introduce library visitors and students to the term ‘Jain’, to the fact that it is a living tradition and to introductory concepts through visual images. 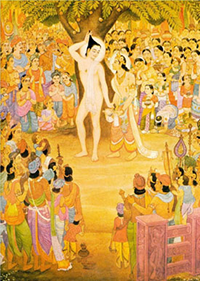 The Jain tradition is lesser known in the U.S. — and there are misconceptions that it is only an ancient tradition of wandering mendicants practicing extreme austerities — so an exhibit is one of several ways we begin to create greater familiarity with Jainism as a living tradition composed of both lay and mendicant adherents, and thus, to add another foundational layer to the future of Jain studies at Rice University. This is an event from the childhood of Bahan Satyavati Ji. Once she was returning from the school, she saw a tomato seller sitting on the road. When she reached home her mother told her, "Oh my dear daughter, take this coin of fifty paisa and bring half kilogram of tomatoes from the market." She set out immediately and reached the tomato seller. She asked him to give her half-kilogram of tomatoes. When the tomato seller gave Satyavati the tomatoes, she asked the price of tomatoes. He replied only twenty-five paisa. She gave him the coin of fifty paisa. But by mistake he returned her six coins of five paisa instead of five coins. When she counted the money. she found that the seller had given her one coin more. She stopped for a moment and thought, whether she should return the money or keep with herself. Finally, she decided to have the money, but when she reached home, she saw that there were only five coins with her. She was very surprised and came to know that one coin was of dishonesty and it fell down from her hand. After this Satyavati took an oath never to be dishonest in her life. More than 50% spots are taken for the YJA Convention! Don't miss out on an unforgettable experience this July in Chicago, IL. Register now at convention.yja.org to join them for a once in a lifetime convention experience as they Reconnect with Our Roots! Do you have a talent you’d like to showcase at the 2018 YJA Convention in Chicago? Whether you’re a dancer, singer, musician, comedian, or performer, we’d like to see you rock the stage! Start gathering your friends and bring your amazing talent to Chicago for the best talent competition yet! This year, we’ll be binge-watching some of your favorite TV shows starring YJA’s very own attendees showing off their best skills! Check out the registration packet under the “Social Programming” tab at convention.yja.org! Applications are due April 15, 2018.